I have a confession to make- I have never been to summer camp. Or, at least I hadn’t experienced camp until this past week when I went to the Center for Courageous Kids, where there was a week for pediatric pain. This was made possible by a collaboration between The Coalition Against Pediatric Pain, RSDSA, U.S. Pain Foundation, Rock Out to Knock Out RSD, and of course The Center for Courageous Kids. It is amazing what we can do when we all work together. I was able to adventure to Kentucky to represent RSDSA at this camp and had some fun of my own! The children and their families were able to partake in a few days of pure fun. The theme of the week was “Get Animated” and featured characters like the Minions, Baymax from Big Hero 6, and other popular animated characters. Each family was assigned a counselor or two to help them through their time at camp. The counselors were fantastic. Several of them are going to school for various medical degrees. They are the future of medicine. The kids all seemed to bond with their counselors instantly. As the week went on, the counselors seemed to become more and more interested in the rare conditions and diseases that the kids had. But, there was never a focus on being “sick kids,” only on the fun to be had. The kids were not required to participate in every activity. If they needed to go sit down or to go nap, they were able to do so. There was archery, horseback riding, fishing, canoeing, paddle boating, cooking, and bowling, as well as woodshop, arts & crafts, beauty shop, a pool, a gymnasium, and an arcade. Those were just the activities that the kids could participate in daily. Each area had a water cooler for everyone to fill up their water bottles, as the heat was incredible. If it was an outdoor activity, there was also a cooler with cooling towels to help prevent overheating. It was perfect. The counselors kept making sure that their kid was hydrated and made sure that an adequate amount of sunscreen and bug spray had been applied. There was also a carnival, a movie night, talent show, and the Messy Games. The Messy Games seemed to be a highlight for everyone. Each family was assigned to one of the lodges at CCK- red, green, blue, or yellow. Before the Messy Games, everyone got paint each other’s faces with the color of their lodge. They all came out to the main court yard with their team flags, chanting their lodges various cheers. There were four stations for each lodge to go to. One station involved pudding, another station involved oatmeal, another involved shaving cream, and another was a mystery slime. The goal of the Messy Games: use each of the four stations to try to make your team the messiest. The messiest team wins. I stood in the “safe zone” watching everyone cover each other with everything to try to become the messiest. Parents, counselors, kids, and other CCK staff members were all laughing, chanting, and flinging the mess at each other. I couldn’t even tell you which team won; I just remember only being able to see people’s eyes after the games were over. After the games, they were all able to dump water over their heads to clean off. This water war was just as entertaining as the Messy Games. The talent show was a nice surprise. There was some singing, some acting, and some musicians among other talents. The counselors helped out if their camper wanted to participate, whether it was holding their microphone for them, being background dancers, and helping keep everything as smooth as possible. These kids had some truly amazing acts, it just took the talent show to get them to expose these hidden talents. We all even got our own Playbill with the featured talent listed. We had our own Elsa, a mini Taylor Swift, a female Sherlock Holmes, and more! Mealtime was the perfect time for everyone to bond. Everyone had the chance to sit together at the long tables. This is where everyone could chat, plan the day, vent, and just hang out. CCK was very attentive to the different dietary restrictions that some people had. Everything was labeled to say if it contained gluten, dairy, eggs, nuts, and other allergens. There was a separate area in the back where people could go to get the gluten free and/or vegetarian option for the day. Mealtime can be stressful for some, but not this time! I look back on my week in Kentucky and tears instantly form. It was such a happy time. There was so much positivity and joy. I wish that I had been able to go to a camp like this when I was younger, although I’m sure I still would have ended up stuck in the middle of the pond in a paddle boat. It was truly amazing to get to know the kids, parents, counselors, and other staff members at CCK. Thank you to all who came out to participate and all who came out to help. This camp was a dream come true for everyone. This was a brainchild and dream of Sue Pinkham, so please join me in thanking her with the Sue chant that rang through CCK: Sue, Sue, Sue, Sue, Sue, Sue, Sue!!! RSDSA is extremely proud to have been a part of this pilot year for the pediatric pain camp. We have high hopes for another camp experience in years to come. We know there are more kids out there that would greatly benefit from and enjoy this camp. 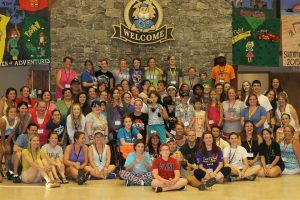 If you would like to learn more about this camp, and/or how you could potentially help in years to come, please contact Sue Pinkham at suepinkham@comcast.net or (781) 771-2095.